Set in northern Iceland in 1829, Kent brings to life the last few months of the condemned woman’s life as she is sent to wait for her execution on a remote farmstead. Kent’s acclaimed first novel was shortlisted for the Guardian First Book Award 2013 and has won numerous awards in her native Australia. We caught up with the author to find out more about what draws her to Iceland and how she came to write this incredibly evocative first book. When did you first visit Iceland? I first visited Iceland as a seventeen-year-old exchange student with Rotary, in 2003. I stayed for one year, fell in love with the country, and have been back many times since. Do you have a favourite place in Iceland? I have many favourite places, for a multitude of reasons. As an exchange student I lived in Sauðárkrókur, which is a small town in Skagafjörður. I often return there, as it’s where many of my friends live. It’s also surrounded by exquisitely beautiful countryside – mountain ranges and old glacial valleys, and magnificent fjords. There’s lots of history in that area too. The north of Iceland from Húnaþing Vestra to Akureyri is my usual stomping ground. In recent years, however, I’ve been able to spend more time in Reykjavik, and I love that city. It has a wonderful vibrancy. Was it the difference from Australia that first attracted you to Iceland? It was the differences between the two countries that first drew me to Iceland. I wanted to see snow for the first time. I wanted to learn another language, to see the northern lights, and to experience the long hours of darkness in winter and the midnight sun in summer. Iceland seemed an exotic place to me then, and utterly different to what I was used to. I saw the two countries as polar opposites. However, the more time I spend in Iceland, the more similarities I notice. In particular, I see prevalent characteristics amongst both Icelanders and Australians that I think must come from living on an island with extreme climate. There’s a tendency towards stoicism and fortitude, particularly amongst Australians and Icelanders who live in rural areas. There is often a love of landscape, and a deep respect of its power and magnitude. The harder I look, the more parallels I see. What are your favourite things to do/see/experience in Iceland? One of my favourite things to experience in Iceland is the réttir, the annual sheep and horse round up in September. 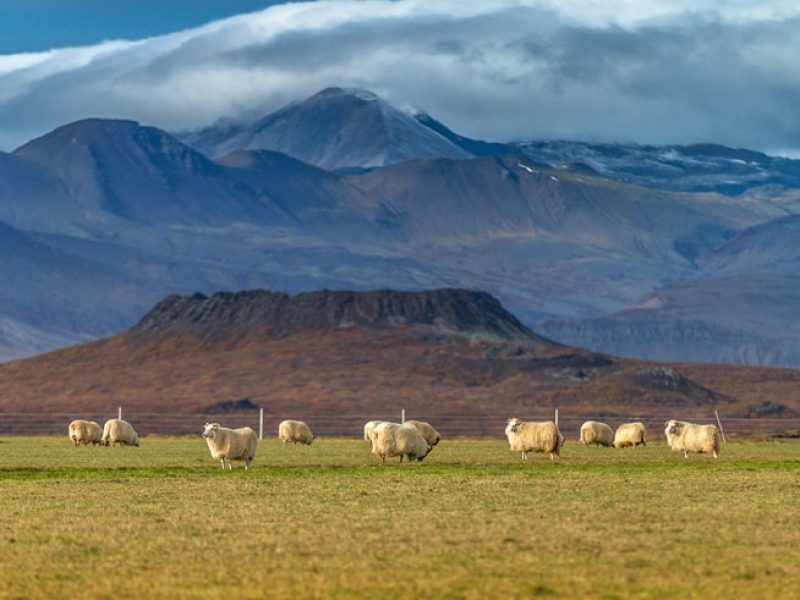 This is the time when the locals set out into the highlands to round up the sheep and horses that have been grazing and roaming free during the summer. After the stock has been driven down the mountainside, the animals are driven into a sheepfold, where farmers then identify their own and separate them. The réttir is often a wonderful opportunity to see the countryside and appreciate some of its traditions. I also love to experience Christmas in Iceland. The houses and townships are covered in lights, the snow is magical, and the Icelandic Yule Lads – the thirteen Santa Clauses that ply various trickery in the nights leading up to Christmas – are everywhere. The food is wonderful, and the Christmas drink – a mix of orange soda and malt drink – called Egils Malt og Appelsín is fantastically addictive. The other things I love to do in Iceland include bathing in the hot springs, horse riding cross country, and afternoons of coffee and chat with the Icelanders I’ve had the good fortune to meet. When and where did you first hear the story of Agnes Magnúsdóttir? I first heard the story of Agnes Magnúsdóttir when I was living in Iceland as an exchange student. A few months after my arrival in Sauðárkrókur, my host parents took me on a drive through Vatnsdalshólar, a peculiar expanse of small hillocks that surround the main road carrying traffic between the north and south of Iceland. They pointed out three hills in particular, called Þristapar, and told me that they were the site of Iceland’s last execution. When I asked them what had happened and who had been killed, I was told that a woman called Agnes Magnúsdóttir had been beheaded in 1830 for her role in the murders of two men. Over the course of my exchange, and in the ten years that followed, I slowly discovered more details about Agnes and her life’s trajectory through a combination of research, reading and coincidence. This is based on a true story, have you had any reaction from or contact with descendants of the characters you portray? I recently received an email from Natan Ketilsson’s great granddaughter (Natan was the man Agnes Magnúsdóttir was accused of having murdered), which was a lovely surprise. I’ve also been contacted by several Icelanders whose relatives had some role in the events, or who have a unique insight into the story. I am grateful to all of them, for they have accepted this retelling with astonishing good grace. It’s a dark and difficult tale in many ways, who do you have most sympathy for? I like to make a distinction between sympathy and empathy. Sympathy, I feel, is a feeling of pity and sorrow for another, whereas empathy is the attempt to understand or share the feelings of another. My approach in writing this book was to work out of empathy, rather than sympathy. I wanted to understand these characters more than I wanted to feel sorry for them. Most of my empathy was directed towards Agnes, but not necessarily because I felt she was most deserving of it. The novel, I knew, would privilege her perspective, and so it was important for me to try and gain an understanding of her feelings and interiority. Personal freedom is a big theme within the story – do you think the co-dependent relationships with neighbours that were prevalent in 19th century Iceland are still familiar to contemporary Icelanders? It’s a good question, and one I’m not sure I have the authority to answer. I would hate to speak on behalf of Icelanders. That said, in my experience I have certainly perceived a strong awareness of kinship networks, and a deep respect and interest in community. Co-dependency is perhaps less vital to survival than it once would have been, but it seems to me that ties to friends, family and neighbours continue to ensure collaborative and harmonious Icelandic communities. I have many. There are the authors I have long loved reading, whose work inspires me to better my own. These writers include Margaret Atwood, Thomas Hardy, Janet Frame, Ron Rash and Angela Carter. Then there are the other artists (mainly musicians) that similarly motivate me to improve my writing, or to try new things: I have a great love of singer-songwriters, as I admire their concise lyricism. One of my greatest sources of literary inspiration is people watching. Daydreaming also turns up the most wonderful ideas.